one-on-one photo lessons that may begin most days and times. Classes are designed to fit your specific needs and schedule. Private lessons are for ANY skill level photographer (9 yrs. old to adult) who needs a quick 1-2 hour lesson or several weeks of learning about ANY camera or ANY photography subject. Classes are taught at the Tannery in Newburyport, MA or in your home or business (see bottom of page). Classes may be scheduled ANY day of the week, during the day or evening and even be scheduled differently from week to week. Private lessons may also be taken several times to truly master the art of photography. 3 options are available for private lessons at the studio in Newburyport: The more classes you take the more you save! Kelly is available to teach beginner or advanced level photography subjects by the hour at her studio. This generally means learning 1-2 photo subjects. For example, learning about a couple of setting or modes on your camera, flash or composition, etc. FAMILY & FRIENDS DISCOUNT: $165 for 2 hours for 2 people. In 4 weeks, you can learn what you would learn in Photo I or II. Which consists of learning about your camera, flash, composition, lighting etc. and go on fun field trips to practice photographing. Classes are held at Kelly's studio in Newburyport for 2 hours to allow for practice time. FAMILY & FRIENDS DISCOUNT: $600 for 2 people ($300 per person) for 4 private lesson. In 8 classes, you will gain an even greater understanding of your camera and advance your photo taking skills by learning about photo subjects that are of interest to you, i.e. photographing people, landscapes, night etc... Plus, go on fun field trips together to practice photographing. Classes are held at Kelly's studio in Newburyport for 2 hours to allow for practice time. All private lessons are individually designed to accommodate the beginner, intermediate or advanced level photographer. Some ideas for subjects that may be learned is learning about your specific digital or film camera and all of their modes and settings, using your pop-up or dedicated flash, how to properly photograph subjects in low light and Menu items such as, white balance, ISO, file size, file types, formatting etc. Finally, you may also learn how to compose your shot and take better photographs of, landscapes/nature, night (time-lapsed) photography, macro/flower photography, portraits of people/kids (candid or formal), how to design a portfolio for college or preparing for a gallery exhibition, etc... Just email Kelly to talk about your interests in learning more about? To enroll in a private lesson, contact Kelly to discuss your specific photography needs and to schedule your class. Payment is due in full the first day of class. 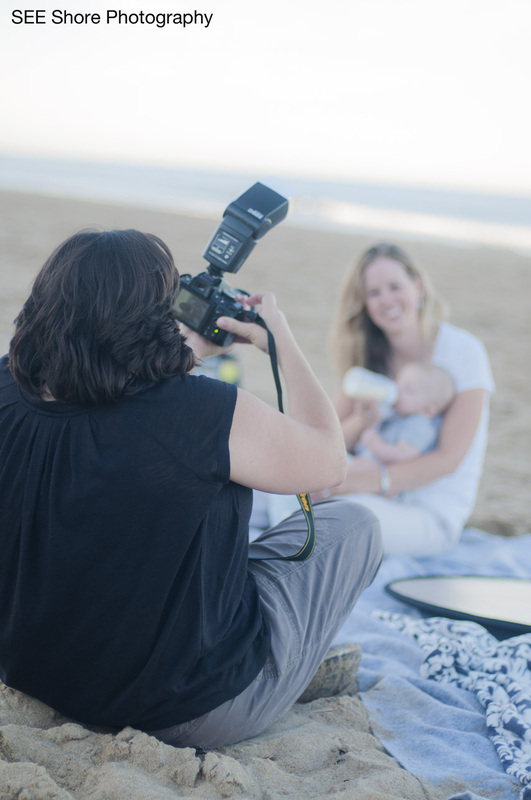 Former student, Karen photographing another former student modeling with her new born baby. A private photo lesson with, Chrysa, Sue, and Kara. Three friends who were in a private lesson together and practiced photographing alpacas. co-workers, friends or family members (up to 15 people) in your home in Massachusetts, out of state or country. Your private class may be designed to include learning about your camera, indoor and outdoor lighting, composition, flash photography and really almost any photo subject. Kelly schedules field trips to local scenic areas to practice photographing and using your camera’s settings. This is the best way to learn photography is by doing = taking photos. This type of private lesson is for the student(s) who want to learn beginner or advanced photography subjects and to experience personalized photo lessons. A unique opportunity to learn photography from an accomplished photographer over the course of a day, weekend or week-long class. Discount prices apply to more than 2 people, out of state and week/weekend long classes. Please Contact Kelly Mintz for more information.